13 Glowy Foundations...just in time for spring! My affinity for foundation formulas knows no end! Since starting Beauty Professor, I have been fueled by the desire to continually discover the latest and greatest in foundation formulas. If you haven't yet been witness to this obsession, simply type "foundation" into my search bar for an endless array of swatches of nearly every base imaginable! The past few months have been rife with new foundation releases...especially radiant ones. Consequently, I am happy to offer you a video overview of 13 glowy foundations--ranging from sheer to full coverage--that will get you ready for the imminent sunshine of springtime. A swatch of Rodial Glamstick in Bite in direct sunlight...this creamy balm has the opacity of a lipstick! Tom Ford Eye Color Quad in Disco Dust (reviewed HERE): Currently backordered everywhere but I found it still in stock at Saks!!! All 13 foundations in order of their appearance in the video. Swatches of the first 6 formulas in mixed outdoor lighting. Swatches of the first six shades in direct sunlight with a flash. 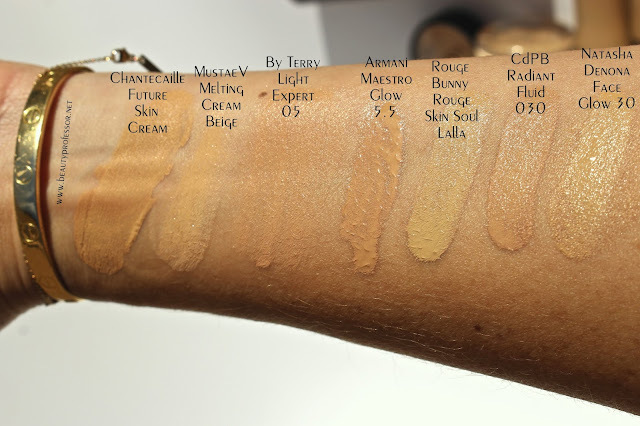 Swatches of the last seven formulas in mixed outdoor lighting. Swatches of the last seven formulas in direct sunlight with a flash. Bottom Line: I truly hope you enjoyed this video and, as always, welcome your questions and comments. 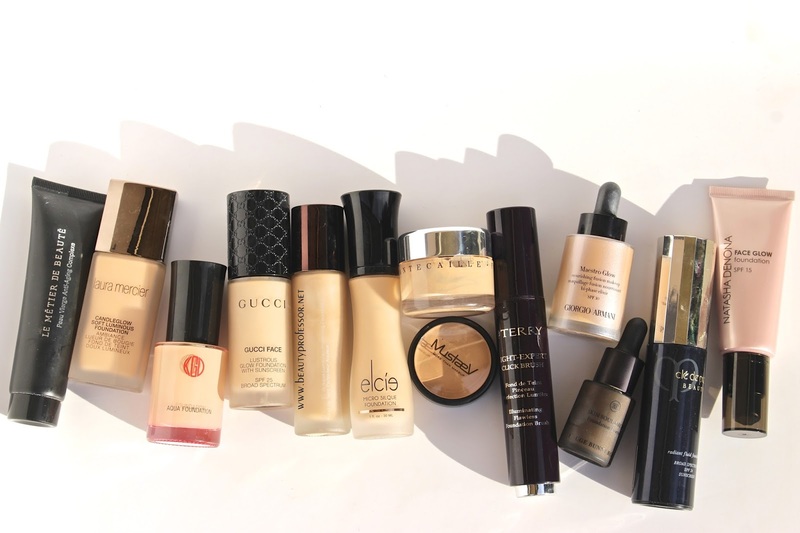 Which glowy foundation has caught YOUR eye? SAVE the DATE // I am excited to announce that I will be hosting the Neiman Marcus Beverly Hills Project Beauty on Saturday, February 27th! The free event, which features a cavalcade of new spring beauty as well as sips and snacks and an array of beauty and skincare brand experts, will begin at 11 AM! If you are a Southern CA local (or will happen to be in the area at the time), please plan on attending...it would be wonderful to meet you in person. Good things ahead, including another Tom Ford eyeshadow closeup, a Rodial beauty feature, a Valentine's Gift Guide and a host of new product procurements! Love love this post! Thank you for the very informative overview. Of course I now want them all! Thank you, Rosemary! So glad you found this post informative! Rachel you look stunning! 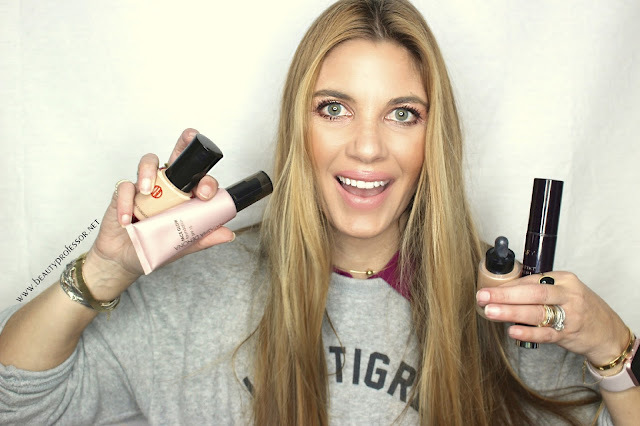 This video is the stuff of dreams....ohhhh how Inlove radiant foundations! I wanted to ask, what do you think of the Eve Lom Cream Compact foundation? I've literally had it in my SpaceNK cart for a month now lol! I was wondering if it's a satin/luminous finish or if it's more matte? I definitely don't want another matte base, I need some glow in my life! I just took the plunge and tried the MatchCo foundation...it's lovely but not as radiant as I hoped, it dries to a more natural/demi-matte finish. I'll definitely get lots of use from it because the formula is really nice, but I'm still on the hunt for that perfect luminous base. Thanks a ton for any info you could give! I hope you have a superb weekend, my beautiful friend! With regards to your question about the Eve Lom, I have it and it's lovely but I couldn't get a solid match in the range of options. It has a touch of glow and medium coverage but I didn't get stellar lasting power out of it. You have me intrigued by the MatchCo foundation! Love your info and discovering new foundations like the ones from By Terry Light and Elcie! I'm curious about what you think of Nars Velvet Matte Skin Tints and the new Hourglass Strobe Lighting Powders. Can't wait or your next post! Thank you so much!! I haven't yet tried the new NARS formula and I LOVE the Hourglass Strobe powders...they have since been featured in my blog! This was a treat to watch. Like you, I adore foundations! Your selection of glowy formulas is impeccable. How about one about concealers, and one about primers, and face powders, and .... ad infinitum! What a thorough review; thank you so much! My pleasure, Susan...thanks for the kind feedback! Love the post (as always)! Do you know if the Rouge Bunny Rouge skin soul drops has SPF in it? Thank you...and with regards to your question, no SPF in the RBR Soul Drops! Goodness, I feel like you get more beautiful in every post and video. Thank you for your wonderful video! I just bought the LMdB peau vierge as per your suggestion and I was wondering how you would use it if you also want to use a separate primer to help with foundation longevity? My second question is about the RBR drops. Are they fairly long lasting? And how do they compare to the CoverFX? Hello dear MG...thank you ever so much for the compliment!! I have missed our chats! I am so glad you now have the PV and with regards to your question, I generally use it as a standalone primer rather than adding an additional layer of product. Also, the RBR drops are long lasting and I much prefer them to the CoverFX as they are smoother and have a more luminous, real skin finish (even though they are full coverage). Love them! Rachel, I had to tell you that I finally tried my sample of Mila Moursi's "Cryo Serum Ice Cube Infusion." Post Super Bowl, I woke up definitely feeling I had overindulged and this was amazing. It revived my skin, particularly the under eye area and the herbal scent even helped my headache. I will definitely be purchasing this soon. Thanks for turning me on to this brand. I am thrilled to hear that the MM Cryo Serum Ice Cube Infusion is so good...I have one awaiting trial in my freezer and your assessment will prompt me to give it a spin this weekend! So happy you're loving the line as I am! I just turned 40, have normal to combination skin with a neutral to slightly golden undertone. Which foundation would you recommend, that does not settle into pores and lines, does not cling to drier patches nor makes my t-zone look oily? I would suggest the Natasha Denona Glow Foundation...it has all of the characteristics that you are seeking!